The National Audubon Society usually has numerous full-time, part-time and intern opportunities available related to wildlife habitat restoration. Now in its second century, Audubon is dedicated to protecting birds and other wildlife and the habitat that supports them. Audubon’s mission is engaging people in bird conservation on a hemispheric scale through science, policy, education and on-the-ground conservation action. By mobilizing and aligning its network of Chapters, Centers, State and Important Bird Area programs in the four major migratory flyways in the Americas, the organization will bring the full power of Audubon to bear on protecting common and threatened bird species and the restoring critical habitat they need to survive. And as part of BirdLife International, Audubon will join people in over 100 in-country organizations all working to protect a network of Important Bird Areas around the world, leveraging the impact of actions they take at a local level. What defines Audubon’s unique value is a powerful grassroots network of nearly 500 local chapters, 23 state offices, 41 Audubon Centers, Important Bird Area Programs in 50 states, and 700 staff across the country. Audubon is a federal contractor and an Equal Opportunity Employer (EOE). 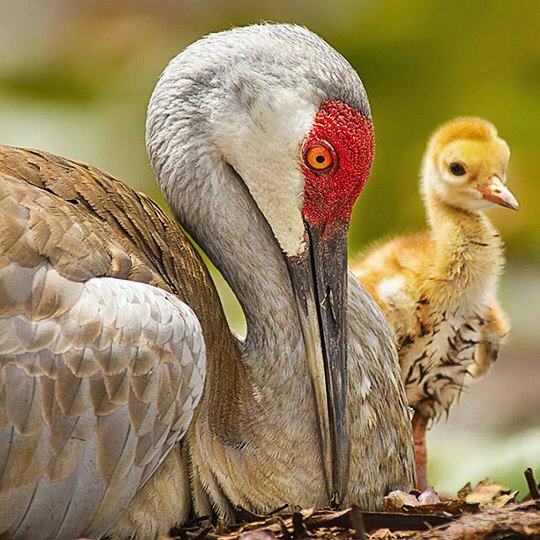 Photo of sandhill crane and chick courtesy of the National Audubon Society. See current open positions involving ecological restoration.